Roadhog speaker cables from RHC AUDIO are "Road Ready and Tour Tough". 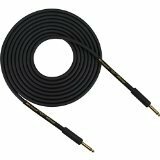 This unique design of speaker cable provides a lifetime of performance for the musician that uses their gear night after night. Utilizing the best pure copper conductors and shielding materials for a quality sound and encasing that sound in an extra thick rugged PVC skin for guaranteed durability without sacrificing flexibility. If you have any questions about this product by Rapco Horizon, contact us by completing and submitting the form below. If you are looking for a specif part number, please include it with your message.